I'm attempting to compile Java 1.4 code that was created by IBM's WSDL2Java on Java5 without recreating the stubs and saw this error in Eclipse. I'm under the assumption that the stubs created should just compile as long as the runtime jars are available (they are). Is this a case where I am trying to refactor a pig from sausage? Am I better off recreating the stubs? There's another solution that also works. Go to the Build Path settings in the project properties. Add it back; Select "Add Library" and select the JRE System Library. The default worked for me. This works because you have multiple classes in different jar files. Removing and re-adding the JRE lib will make the right classes be first. If you want a fundamental solution make sure you exclude the jar files with the same classes. http://www.digizol.com/2008/09/eclipse-access-restriction-on-library.html worked best for me. I met the same problem. I found the answer in the website:http://www.17ext.com. First,delete the JRE System Libraries. Then,import JRE System Libraries again. I don't know why.However it fixed my problem,hope it can help you. My guess is that you are trying to replace a standard class which ships with Java 5 with one in a library you have. This is not allowed under the terms of the license agreement, however AFAIK it wasn't enforced until Java 5. I have seen this with QName before and I "fixed" it by removing the class from the jar I had. EDIT http://www.manpagez.com/man/1/java/ notes for the option "-Xbootclasspath:"
"Applications that use this option for the purpose of overriding a class in rt.jar should not be deployed as doing so would contravene the Java 2 Runtime Environment binary code license." "Java Technology Restrictions. You may not modify the Java Platform Interface ("JPI", identified as classes contained within the "java" package or any subpackages of the "java" package), by creating additional classes within the JPI or otherwise causing the addition to or modification of the classes in the JPI. In the event that you create an additional class and associated API(s) which (i) extends the functionality of the Java platform, and (ii) is exposed to third party software developers for the purpose of developing additional software which invokes such additional API, you must promptly publish broadly an accurate specification for such API for free use by all developers. You may not create, or authorize your licensees to create, additional classes, interfaces, or subpackages that are in any way identified as "java", "javax", "sun" or similar convention as specified by Sun in any naming convention designation." More information can be found in the Tycho FAQ. This took me AGES to work out, so I figured I would assist anyone else trying to fix these access restriction errors from the command line by posting this answer. Add another JRE with a "perfect match"
clean and build your project again. It worked for me. I just had this problem too. Apparently I had set the JRE to 1.5 instead of 1.6 in my build path. Under Configure Build Path, I had to rearrange the order of my entries under Order and Export. Additionally, as an Eclipse PDE developer, I needed to rearrange the order of my dependencies in my MANIFEST.MF, adding the problematic package as first on the list. Playing with these dials, along with running Project > Clean in between, I was able to resolve these warnings. select the "JRE System Library [jdk1.8xxx]"
Sorry for updating an old POST. I got the reported problem and I solved it as said below. Assuming you are using Eclipse + m2e maven plugin, if you get this access restriction error, right click on the project/module in which you have the error --> Properties --> Build Path --> Library --> Replace JDK/JRE to the one that is used in eclipse workspace. I followed the above steps and the issue is resolved. In the case you are sure that you should be able to access given class, than this can mean you added several jars to your project containing classes with identical names (or paths) but different content and they are overshadowing each other (typically an old custom build jar contains built-in older version of a 3rd party library). Everything works fine in the code editor but fails during the compilation if the "old" library overshadows the new one - d2 suddenly turns out "missing or inaccessible" even when it is there. The solution is a to check the order of compile-time libraries and make sure that the one with correct implementation goes first. Go to the Java Build Path in the project properties. Remove the existing JRE System Library Then Add it again i.e. Add Library-->JRE Lib--select jre--->Finish. Lastly select order and export tab select JRE Lib and move on top. That's it. Just change the order of build path libraries of your project. Right click on project>Build Path> Configure Build Path>Select Order and Export(Tab)>Change the order of the entries. I hope moving the "JRE System library" to the bottom will work. It worked so for me. Easy and simple....!!! In my case there was a mismatch between the build path JRE and installed JRE on execution environment. I moved into Project > Properties > Java compiler. There was a warning message at the bottom. 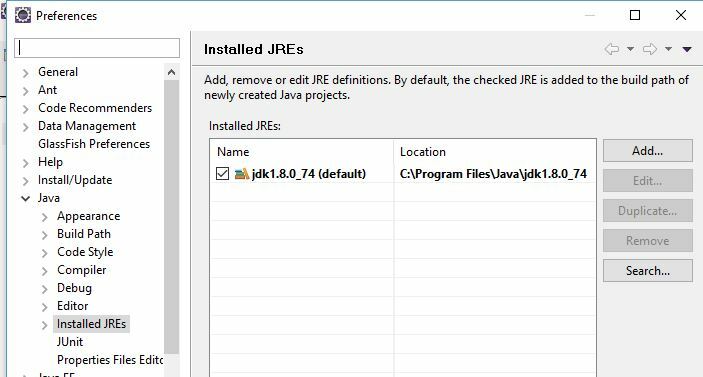 I clicked on the links 'Installed JRE', 'Execution environment', 'Java build path' and changed the JDK version to 1.7 and the warning disappeared. 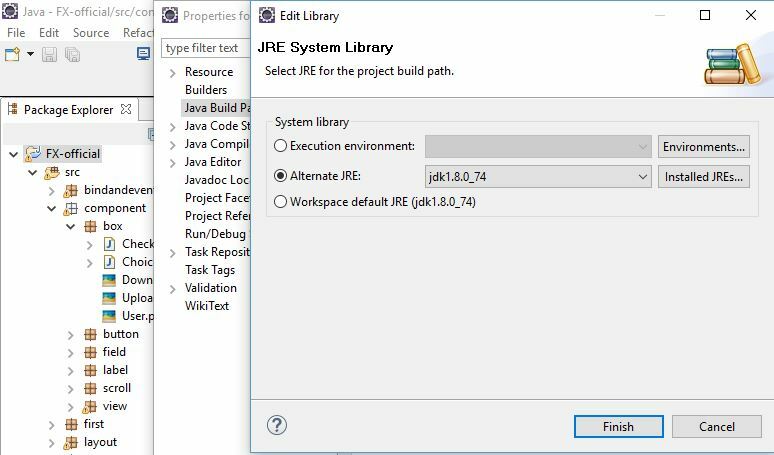 Adding a right JRE System through build path is the solution but your eclipse still may have the error. To solve that go to Java Build path --> Order and Export and move your JRE system library on the top. This has solved my problem. Not the answer you're looking for? Browse other questions tagged java eclipse wsdl stub wsdl2java or ask your own question. Why won't Eclipse let me use the JFrame class? How to get CachedRowSet implementation by Sun in my Java project? What does a “restricted library” really mean in Java?